My sense of the axial, as well as principle, in fact was formed first of all in language, when I was in my mid 20s and studying the work of William Blake. The inquiry took shape in a paper I wrote for a 1967 post-graduate seminar at NYU with the great Blake scholar David Erdman (along with Conor Cruise O’Brien), who encouraged me to rewrite the paper for publication in an anthology of new Blake criticism he was editing with John T. Grant, Blake’s Visionary Forms Dramatic (Princeton University Press: 1970). It became “Orc as a Fiery Paradigm of Poetic Torsion” in which I discovered a functioning principle that both allegorized poein in the activity of Orc and embodied it as process of revolution-evolution in the actual process-structure of Visions of the Daughters of Albion and America a Prophecy. The allegory of poetics is at root an activation of alchemical principle and aims to initiate the reader/viewer into a transformative process. This discovery shaped my sense of poetics and refocused for me the work of the poem. My sense of this was embodied in a long poem called Of a Woman the Earth Bore to Keep (published in Stony Brook 1/2: 1968), in which I received upon waking from dream four “Proverbs of Soma” which functioned axially (with variable meaning) and prefigured later axial poems, especially the Preverbs. A sudden development in my own work came in spring 1969 with the advent of torsion poems, especially Homage to What I Hear Is So and The Weight of the Matter or Where It Is Pulling (published in Open Poetry: Four Anthologies of Expanded Poems, ed. G. Quasha & Ronald Gross [Simon & Schuster: New York, 1973]). These poems happened suddenly “out of the blue” and with a sense of such necessity that I had to say to myself “this is not poetry, this is just for me,” to give myself the freedom of unselfconscious emergence. Admittedly they first came after days of little or no sleep, almost in a trance-like state. Friends thought I was losing it, had gone over the edge. Perhaps I had, and for some months I had lingering doubts side-by-side with continuing excitement. It wasn’t until my first mescaline experience in 1970 that I actually grasped the singular truth of the torsion principle in these texts, with the first inkling of the evolving axial. 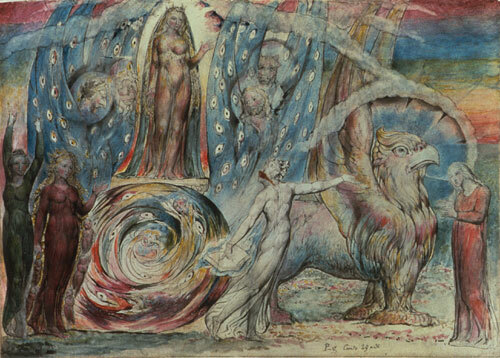 And there the curtain went up: in a totally dark room I saw a wall-sized living event of Blake’s great painting Dante Beholding Beatrice in the Star Car (perhaps more commonly known as: Beatrice Addressing Dante from the Car [ca. 1824-27]). I then knew that the function of poetry/art is not essentially metaphoric or representational or dogmatic but experientially direct and primary, a limen at the edge of another dimension. The poem, the work is the space where one stands between dimensions and allows a certain oscillation. torsion poems, axial poems, and preverbs. I point to these works in particular because they seem such clear embodiments of the underlying principle. Yet the torsion/axial principle is also pervasively manifest in more intricate ways in virtually all of my work in poetry, although not particularly foregrounded: e.g., Amanita’s Hymnal, Magic Spell for the Far Journey, Somapoetics, Giving the Lily Back Her Hands, Ainu Dreams, etc.